Next year, I will be teaching Creative Writing again, a class that will be greatly influenced by my reading of Lynda Barry’s Syllabus book which I reviewed a few weeks back. That review can be read here. I’ve recently been so obsessed with a few games that as I’ve played them, I’ve been jotting down notes of my thought processes…things like, how did that happen, what could I have done differently, what did that thing someone said mean? Those types of things. I’ve decided to keep the log and eventually try to add some of those moments into other things that I write. This gave me an idea. Why not try that process with my Creative Writing class. So next semester, I am going to try that with my class. I will teach them to play five different games that I have deemed a quick learn, thought provoking, thematically interesting, and most importantly…fun! Through the process of learning and playing these games, they will take notes about the process, about themselves, about the games themselves, etc. Then we will have writing prompts where they will have to visit those notes and use them to complete a creative writing assignment. 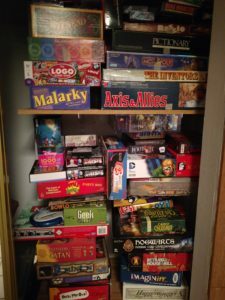 I have no idea how it is going to go, but I know a few things: kids like games; card and board games have kept kids off of electronic devices in my room in the past; games can spark imagination. 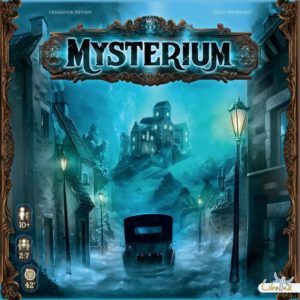 Mysterium: I reviewed Mysterium in the 365, and you can find the review for more info here. 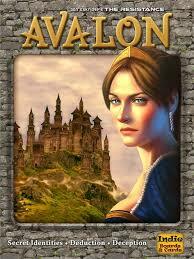 Avalon: this find the spy game is amazing, and every kid that I’ve payer it with has loved it. Not only does it teach perception and problem solving, but this game forces you to forget the outside world and engage. There are also variations for more advanced players. 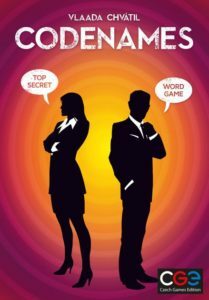 Codenames: this game has a bunch of cool versions, but for the classroom, I’d suggest original word version or Codenames Pictures. This is a team game. One person has a secret list of words/images that they are trying to get the other team members to guess without accidentally helping the other team. Super quick and super fun. Lots to think about too! 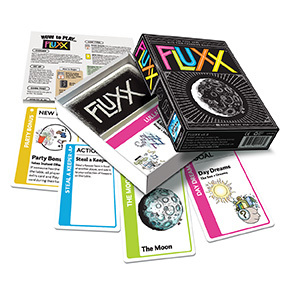 FLUX: the rules change as you play, and there are so many themed versions out there, you will find versions that your kids will dig. Plus, it’s just a deck of cards, so it’s cheap to acquire. This one as well as Codenames can be found practically anywhere. I’d start with original FLUX to get used to game play, then switch it up. I also own Zombie FLUX. 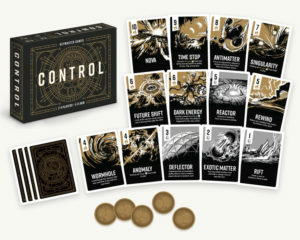 Control: super quick and easy to play, Control puts players in a time not their own and forces them to try and refuel their time machine and take off before others players can! Simple but lots of strategy. The more you play, the more you get it. Plus the bonus addition of time machine fun adds to the storytelling. Seriously, five amazing games to get into your classroom library, and if your school has a games library in the actual library, send this list to the librarian. 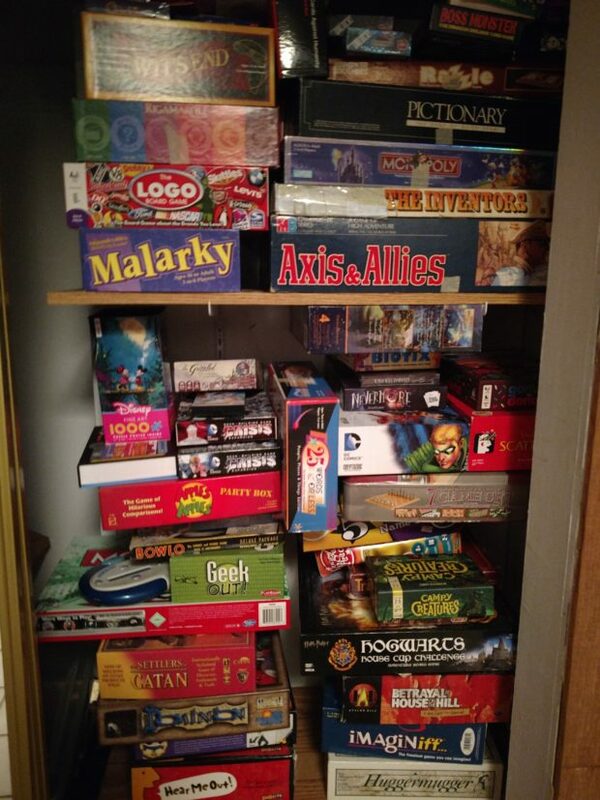 All of these are quick pick-ups…maybe with the exception of Mysterium, but that game is too good to pass up! I’m really excited to bring you more classroom games during my “Storytelling is not Dead” chunk of posts coming after this batch. Stay tuned!